Verizon is looking out for itself as the firm and other top carriers anticipate Comcast and Charter Communications to enter the wireless space. The cable companies plan to invoke their mobile virtual network operator (MVNO) agreements with Verizon, melding their WiFi networks with the carrier’s wireless services for mobile offerings, Inside Towers has reported. Tower owners and AM radio station owners may have more options than it first appears for a joint Return on Investment. Some owners of heritage AMs are receiving real estate offers from developers that are so lucrative they must seriously consider them. In some cases, they’ve decided to sell because the land surrounding the tower sites and directly under the structures and even the value of the AM station itself, is worth much more than the station’s revenue. Two big land deals Inside Towers recently covered are Cumulus-owned KABC/KLOS, Los Angeles and WMAL in Bethesda, Maryland. Denver has one of the slowest mobile data speeds in the country, experts agree. A combination of more people moving into the area, increasing demand on cell networks, is one reason but the larger reason has to do with spectrum. Of the four companies servicing the area, not one company has a big chunk of spectrum, reports the Denver Post. AT&T is reportedly looking to revise tower lease deals where it can. Letters seen by FierceWireless purport to show AT&T pressing tower operators for new terms, and in some direct language, asking for lower rates. Now Charter Communications wants to be in the wireless business too. The news comes a day after rival Comcast said it plans to invoke a 2011 deal with Verizon and launch a wireless service that would run on a combination of its own WiFi and Verizon’s network by mid-2017, Inside Towers reported yesterday. FCC Chairman Tom Wheeler and CCA can trace their roots back to 1992 when Wheeler started as the head of CTIA and CCA first began. Wheeler opened the annual CCA Convention yesterday in Seattle saying the federal agency is “pursuing an aggressive agenda to seize the opportunities of mobile for rural America. 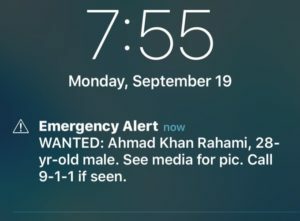 Millions of New Yorkers’ cell phones screamed out an air raid siren-like sound yesterday morning flashing a message that said “WANTED.” The alerts signaled the manhunt for a suspected bomber in the Manhattan blast that occurred on Saturday but also represented the first digital manhunt in New York City. 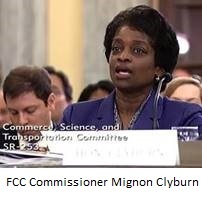 Broadband deployment, and especially 5G infrastructure is key for the nation’s economy, FCC Commissioners told lawmakers at last Thursday’s oversight hearing before the Senate Commerce Committee. In what is likely the last time the current makeup of Commissioners will appear before Congress, Chairman Wheeler discussed the Spectrum Frontiers Report and Order, which the agency recently adopted to speed development and deployment of 5G wireless technology. The European Union promises to unsaddle companies with less regulation as they deploy 5G. All cities and transport links in the EU should have reliable 5G coverage by 2025, according to European Commission President Jean-Claude Juncker. However, 17 European wireless operators say the blueprint doesn’t match up to their expectations and leaves out key points. Overall, the EU plan puts infrastructure deployment incentives in place but also puts the burden on the industry to harmonize standards without offering much help, reports the-mobile-network.com. The new plan is intended to clear out regulatory barriers across Europe to broadband deployment, making it easier to invest in infrastructure, both locally and nationwide, reports Mobileworldlive.com. Have U.S. Carrier Profits Peaked? Unlike other developed wireless markets around the world, the U.S. has seen dramatic growth in EBITDA per POP over the past six years, despite the fact that the industry has essentially gone from a two player market to a four player market with the emergence of T-Mobile and Sprint as competitive factors. UBS believes this will begin to impact the financials in 2017. Cell phone towers are at the heart of the country’s 911 system, one which is vulnerable to attack, according to researchers in Israel. Fifteen years after the September 11 attacks on the U.S. comes the sobering news that the nation’s 911 system could potentially be hacked. 3M has committed to weekly briefings with members of the Telecommunications Industry Registered Apprenticeship Program (TIRAP) about its recall of the original tower climber Lad-Saf sleeve. After 30 years of use, the fall protection equipment has been replaced by a redesigned Lad-Saf sleeve, Inside Towers reported last week. It was the best of auctions, it was the worst of auctions…depending on whom you ask. While broadcasters are bemoaning a shortage in bidding of $66 billion dollars in Round One, carriers are pointing out they spent lavishly compared to past auctions. The carrier version of events comes after the FCC’s auction of spectrum surrendered by broadcasters came in at bids well short of the $88 billion goal last week…$66 billion short to be exact…necessitating more rounds. Just like the cloaking device on Star Trek, 3M has come up with a way to disguise cell towers. That matters for carriers looking for faster site acquisition and less opposition to new structures. The new 3M Conceal Film adheres to antennas and cell site equipment with no impact on RF performance and no signal degradation, according to the manufacturer.